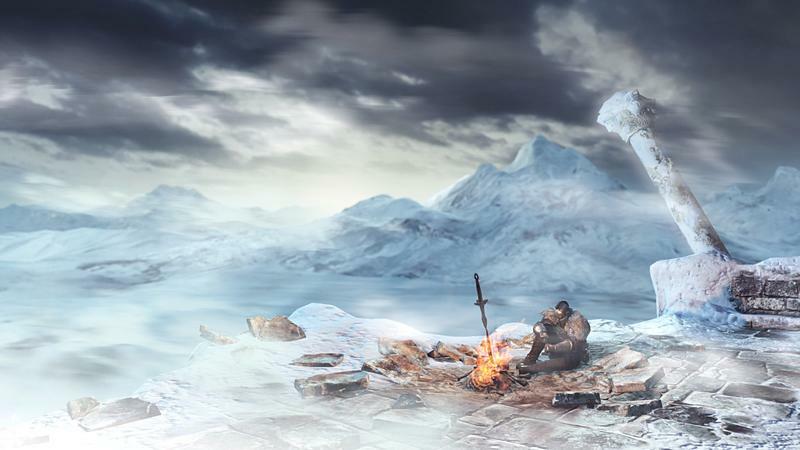 Dark Souls II "Crown of the Ivory King" DLC Trailer - Winter Wonderland of Death! Dark Souls II has done a fabulous job of keeping itself relevant throughout the entire year thanks to the modern day magic of DLC. Crown of the Ivory King is the third and final DLC package for the game, and it takes our undead hero to the far reaches of this fantasy world where snow and frost cover the bloodstained ground. Readers might know that I was not the biggest fan of the popular sequel, but these packages have obviously benefited from the additional development time the original game did not have. Monsters are more detailed; the textures of the world are more fleshed out. Boy oh boy does that snow do miraculous wonders in covering up the ugly grass and moss that polluted the main game's setting. It's still nowhere near the standards of the TGS build I played back in 2013, but it's nice to see that FromSoftware has been able to work around the graphical limitations of the previous generation consoles with extra time and experience with their engine. I have been meaning to go back and give Dark Souls II a third chance, and I think the DLC might be a place to rebuild my stamina and refocus my efforts. Dark Souls II is now available for both the PlayStation 3 and Xbox 360 versions of the game.